What are some of the best natural remedies for POTS disease? Pharmaceuticals don't help and I hate the side effects. 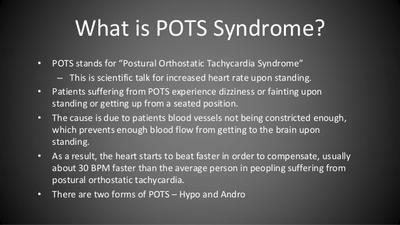 Postural Orthostatic Tachycardia Syndrome or POTS is a condition where the autonomic nervous system (the part of the nervous system responsible for controlling automated bodily functions such as heartbeat, breathing, and digestion) doesn't work properly. POTS sufferers may also have a heart muscle that's smaller than a non sufferers. This debilitating condition causes the heart to beat rapidly when standing up, however, this can usually be relieved quite quickly by the person lying down. Symptoms of POTS include... dizziness, light headedness, fatigue, inability to stand for extended periods of time and fainting. Natural Cure for POTS Syndrome #1... Regular Exercise: Yes I know, at first glance this seems to go against what you have probably been told you must avoid if you suffer from POTS. However, new research has been able to prove that the RIGHT type of exercise done in the RIGHT way can significantly relieve the symptoms of POTS and even "cure" this condition. The study, published in "Hypertension: Journal of the American Medical Association" took 19 POTS sufferers (18 females and 1 male) and had them begin a 30 to 45 minute exercise session, two to four times per week, before gradually working them up to five to six hours of exercise each week. into their everyday lives indefinitely" Dr Levine went on to say. What was interesting about the study is that "every single POTS patient who completed the exercise regime showed an improvement in heart rate responses and over half - 53 percent - were actually cured of their POTS." Natural Cure Discovered for Debilitating Heart Syndrome POTS. Coffee and Tea; Have a strong cup of tea or coffee every day to help raise your blood pressure. Ginger; Ginger is excellent for constricting blood vessels. Make yourself a nice hot cup of ginger tea every day and use it in your cooking as much as possible. Raisins; Raisins are a traditional Ayurvedic remedy for low blood pressure. Eat at least a handful each day. Licorice Root; This herb is terrific for normalising low blood pressure and curing fatigue. Take 400-500 mg's of licorice root capsules every day for best results. Salt; Salt is also extremely good for normalising blood pressure and shrinking blood vessels. The best (and healthiest) salt to use is Himalayan pink rock salt. This salt is not only high in sodium, it's also high in the other essential trace minerals that help to constrict blood vessels and increase blood flow to the brain. Mix one-half teaspoon of pink rock salt in a glass of warm water and drink down. Be sure to also use Himalayan pink rock salt to salt your food to taste and add to your cooking. Drink Lots of Water; Dehydration definitely worsens the symptoms of POTS syndrome. So it's crucial that you keep yourself hydrated at all times. Aim to drink AT LEAST 2 liters of clean filtered water per day. And be sure to add a slice or two of fresh lemon to your water as well. Lemon juice is also extremely beneficial for POTS syndrome when caused by dehydration. So hopefully these tips and home remedies help you out. Hi! I love this article! It gives me so much hope. I just was curious... I struggle with stairs. Should I avoid them while trying to heal? Or will I still be able to heal doing this program. I go up the stairs all the time & I don't want it to affect the results. Also, with working out, I can work out standing. It's not as enjoyable but I can do it. If I can, does that mean I should? Is it still possible to cure this problem if I do standing workouts? I guess I don't understand how working out the way described heals and what additional protocols I should take. I tend to do everything wrong and need specifics for something to be effective, lol. Thanks so much for posting this article!! Hi Taylor. Firstly, you're welcome. Hope the tips and remedies help you out. With climbing stairs, it's a good idea to try and avoid them if you can while healing, to give your body a break. If you can't then don't stress about this too much - your body will still heal (it's an amazingly resilient machine). If you can work out standing up then yes, certainly do this. The reason why researchers had study participants lie down to do their exercises is so that none passed out. Either way can be used and both are just as effective as each other. What exactly was the exercise regimen? We were told about rowing, but is there a specific amount of time or way of doing these exercises? The article does not give specifics. Exercise in the Postural Orthostatic Tachycardia Syndrome. Instructions	for	POTS Exercise Program. I try it with the pink salt, but may it be nauseating if I drink half a glass, I am P.o.t. patient and desperate. I was diagnosed with POTS in 2008 after having had spinal surgery in 2007. My problem was a mystery to the doctors until they finally put me on a tilt table and performed a tilt test. I didn't completely pass out but came awfully close. They were finally able to register my drastic drop in blood pressure. Anyway, my journey with POTS has been challenging to say the least. I am only on one med, a calcium blocker, but I still experience symptoms. Most recently, due to forgetting to take my BP pill, I found myself with sky high BP and blurry vision. It was like looking through a stain glass window. However, I have purchased a recumbent bike recently and realize after my most recent episode that I need to commit to riding the bike. I have experimented with a recumbent bike at the gym and I do feel better when I exercise verses not doing any exercise. I am active with daily activities, cleaning house, etc, but it's not enough. I remember back when yoga and Pilates was helping me feel much better too. So thank you for posting this article as it's given me determination and initiative to get back into a daily exercise program. Thank you so much! You're very welcome Rebecca. Glad it's given you motivation to get back into your daily exercise regimen. So my POTS has given me an intolerance for exercise. I get extremely dizzy and nauseous, even from just doing normal things around the house. How do you cope with that?